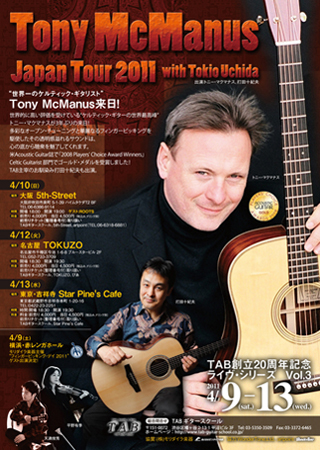 Tony McManus is playing Chalaneru and An Ciarraioch Mallaithe / Muireann’s Jig (from the CD『The Maker’s Mark』). This entry was posted on 水曜日, 3月 23rd, 2011 at 12:33 PM and is filed under ツアー＆ライヴ関係, 未分類. You can follow any responses to this entry through the RSS 2.0 feed. You can leave a response, or trackback from your own site.